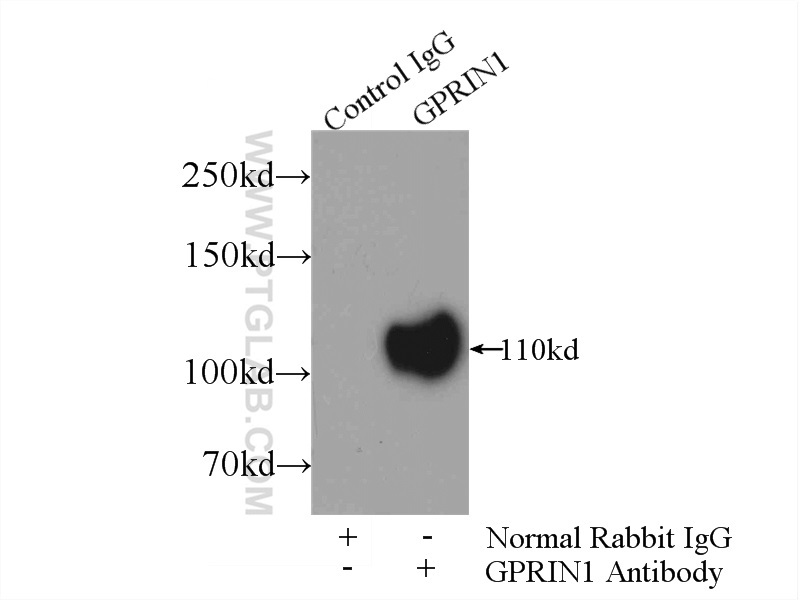 IP Result of anti-GPRIN1 (IP:13771-1-AP, 3ug; Detection:13771-1-AP 1:500) with mouse brain tissue lysate 3600ug. GPRIN1 (G protein-regulated inducer of neurite outgrowth 1), also named GRIN1, may be involved in neurite outgrowth. Western blotting analysis has confirmed its expression in mouse neuroblastoma and rat pheochromocytoma cells. And both GPRIN1 and GNAO1 are membrane-bound proteins that are enriched in the growth cones of neurites (PMID:10480904). It has 2 isoforms produced by alternative splicing. This antibody detects GRIN1 at bands around 110 kDa. Chronic ethanol exposure induces SK-N-SH cell apoptosis by increasing N-methyl-D-aspartic acid receptor expression and intracellular calcium.